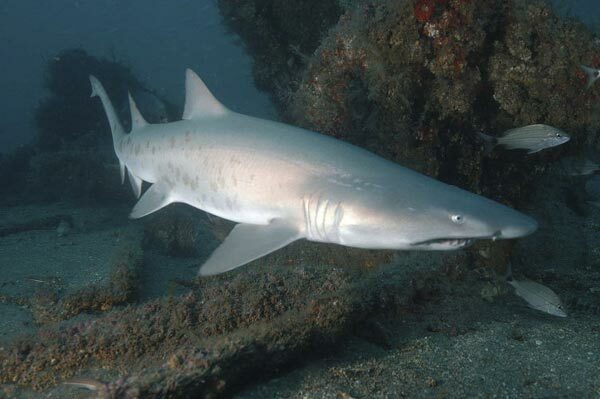 Encounter: Sandtiger sharks. The wrecks of North Carolina are well stocked with resident sandtigers. Certain wrecks tend to have more sharks such as the "Carib Sea" and the Papoose. The sharks are very docile and easily approached with slow movements. No chum is used in these encounters. Divers explore the wrecks which are generally in the 15 to 40 meter depth range and as they move around each superstructure the sharks materialize out of the gloom. Generally they maintain a distance of a few meters but occasionally one will let a diver approach within a few inches. Their ability to maintain neutral buoyancy in the water column means that they can literally hang right in front of a diver without sinking until they choose to swim off. Although the sharks stay put for most of the year, the weather off of this coastline is prone to storms for much of the time which limits the shark diving to the summer months. The sharks also move from wreck to wreck so its possible to hit a wreck that is devoid of sharks sometimes. Operators: The largest and most established operator along the North Carolina coastline is Olympus Dive Center in Moorhead City. This shop runs a variety of boats out to the wrecks depending on the size of the group. Their organization is very good and their knowledge of local conditions is unsurpassed. ODC's powerful boats are capable of reaching most of the wrecks in the area but due to traveling distance they tend to frequent the more southern wrecks. Nitrox is available upon request. Outer Banks Diving in Cape Hatteras is operated by John and Amy Pieno. Due to their location at the most easterly point along the Outer Banks, they are able to run to some of the more easterly wrecks that it is hard for ODC to get to. One of the better wrecks that they visit is The Proteus which lies in about 30m of water and has a very healthy shark population. Under unusual circumstances I have also seen a Great Hammerhead on this wreck - see the article below. Accommodation: Olympus Dive Centre has a Spartan lodge for groups from out of town. The rooms are dorm style and the lodge probably holds around 30 divers. There is a lounge and a small kitchen. Moorhead City has a variety of other hotels in all price ranges. Cape Hatteras is a remote community that fills up quickly in summer. Amy can probably arrange some accommodation when you book your dives or at the very least have some good suggestions of where look. If at all possible book up hotel accommodation well in advance. I have stayed at the Seagull Hotel in Hatteras Town which was good value. Directions: Moorhead City is easily reached from any direction along the eastern seaboard. Cape Hatteras is a little more challenging. It is most easily reached from the north side via Nags Head. There are a series of long low bridges connecting Hatteras Island with the mainland. The drive along the Outer Banks themselves is spectacular. Hatteras Island is a long thin spit of land with huge sand dunes and rolling surf. If coming from the south it is necessary to take two ferries in order to reach the island but the experience of doing so is rewarding in itself.